By spending several hours on an afternoon you can prep and freeze enough meals for an entire month. 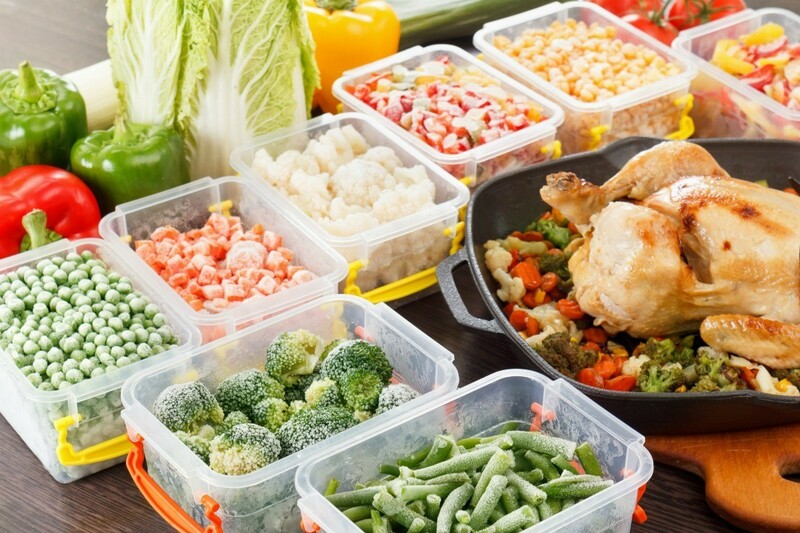 This not only saves time when heating or cooking them later, but you may also save on food costs by buying enough of some ingredients to use for more than one meal while it is on sale. This is a guide about freeze a month of dinners in one afternoon. In just three hours, I made dinners to freeze for the entire month. I do this each month and it's so much easier than freezing the raw meat, then thawing it then cooking. This way, the kitchen is only hot for a few hours. The shots you are seeing are lemon pepper chicken, tuna kabobs, beef tips and polska kielbasa, fajita chicken, and a turkey casserole. I usually fry strips in butter, but have been trying to cut down on fats. 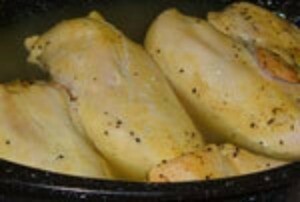 So, I put the lemon pepper on the chicken, poking holes in the breasts for good saturation, added 1/4 cup lemon juice and 1/2 cup water. I bake it at 350 degrees F for about 45 minutes. If the inside is still pink (I use pretty big pieces), just add another 15 minutes to the baking time. I get these in a vacuum packed package at the local warehouse store for $2.99. I bake them for about 15 minutes at 350 degrees F, but the smaller ones need to be taken out when that time is up, leaving the larger ones in another 10 minutes or so. Or, you can make the larger ones smaller if you are not worried about the looks. I cut up into chunks (4 per breast) the amount of chicken I want to cook, then add two packages of dry fajita mix (the powdered kind you get in the gravy mix isle). Then I add enough water just to cover in my crock pot, and turn it up to high. Once boiling, I turn it to low and leave in over night. The next morning, I have chicken you can eat with a spoon. Ideas: If you like this idea, it makes a nice meal. 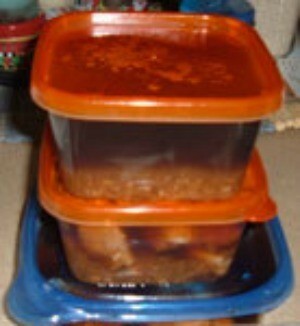 Once this chicken is done, I make sure there is ample juice in the container when I freeze it. When I am ready to heat and eat, I make sure I put the "frozen chunk" in a larger container. 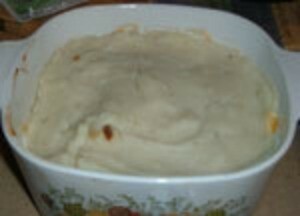 Once the chicken and juice is almost cooked, I add some instant spuds to make a nice creamy "casserole" without having to do much more to it. I also add some corn and when it's done, you have a wonderful meal in just one container. I bake these together because the juices can mix without changing the taste, as they are both similar meats. 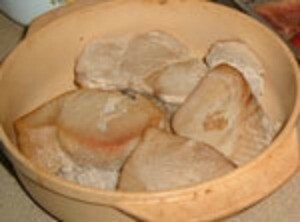 They will be used for sandwiches, soups, or casseroles and freeze great as is. 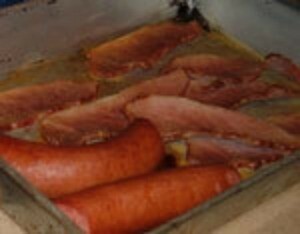 Idea: I like to cut up Kielbasa and add it to red beans and rice. The tips go great in a box of au gratin spuds and a drained can of corn. I always add just a bit of real cojack shredded cheese before I put in in to bake. You need a 4 quart casserole dish or pan with a lid. Line the bottom "layer" with a package of stuffing mix, or left over from a meal. Then, a layer of sliced turkey. I always use Winco's Garlic Herb Turkey, but you can use leftover turkey or even chicken. Then, I put on a layer of drained corn, and one of cojack cheese. The top is a package of Idahoan Instant Spuds, my favorite being 4 cheese flavor. Cover and bake at 350 degrees F for about 30 minutes. I serve it with a package of gravy over each serving, and some cranberry sauce. It's like Thanksgiving any time you want! I hope you enjoy this. Keep in mind that a little work now, (a Sunday or a day off?) can save you lots of time in the kitchen when you are tired or rushed. I hope these ideas have helped. They were Sirloin Pork Tips. I know that sounds funny, but that is what it said on the package. If that was a misprint than I am innocent. Even if they were beef, they still cook really well with the Polska Kielbasa. Make sure and put a little water in then seal with a lid. They both tend to dry out sooner rather than later. PS: Since I have been a cook a lot in my life, I am used to cooking for 60 Gold Campers in Fairbanks, AK, or a dude ranch outside of Tucson. Cooking for one is harder for me than cooking for 60, but I am adapting. Thanks for letting me share! When it says, "Tips & Kielbasa," what are the tips to which you refer? And, more importantly, thank you for sharing these nice ideas! Thanks for your tips! We try to do this but aren't consistent...need to start to be! 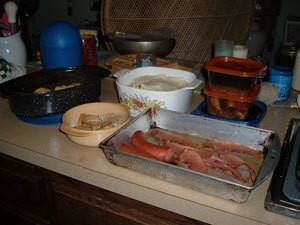 We would make full meals and use the food saver to wrap individual plates for use later. This helped a lot especially when we were doing the atkins diet. Just reheat and you were ready to go! I also freeze my crustless quiche which is great reheated!